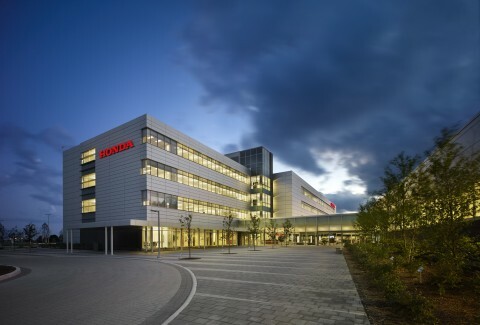 The 17.9 hectare Honda Canada campus in Markham, Ontario relies primarily on Low Impact Development (LID) practices to address stormwater management, water conservation, and other environmental objectives. The stormwater management strategy incorporates a large underground rainwater cistern that stores roof drainage for grounds irrigation. Permeable pavements, drainage swales and an extensive network of biofilters are used to treat runoff from roads and parking lots. The LID practices help improve runoff quality and reduce runoff volumes through infiltration and evaporation, while also providing flow control for the 100 year rain event. Native plants and trees interspersed through the site are combined with jogging paths and a sports field to create a visually compelling aesthetic that helps promote active and healthy employee lifestyles. Capture and recycle rainwater to facilitate conservation of portable water. A key goal of the storm water management strategy was to provide on-site control of runoff in order to reduce reliance on downstream end-of-pipe storm water management ponds. This study evaluates the hydrologic effectiveness of low impact development (LID) practices applied across the Honda Campus site. Challenges and costs associated with adopting this innovative approach to stormwater management are also discussed. Monitoring and modelling results showed that the LID stormwater and water conservation practices were effective in reducing runoff by between 30 and 35% relative to a conventional stormwater approach, while also providing peak flow control for the 100 year event. » Schollen & Company Inc.